MasterPieces: THE DEADLY ASSASSIN | Warped Factor - Words in the Key of Geek. From the very beginning of Doctor Who, the Doctor’s home planet had been shrouded in mystery, though clearly it was a place of unimaginable power, where time travel was commonplace, and which, after the Doctor turned from a white-haired old man into a mop-topped would-be clown, clearly had other magnificent secrets up its sleeve too. Then The War Games happened, and the Time Lords were finally revealed, not to mention named. And as far as it goes, The War Games manages to maintain a bit of Sixties mystique about these ancient powerful beings who can stop the Doctor’s wanderings, and can, with little more than a word and a wave, wipe the threat which had been monopolising the screen for the last ten weeks entirely from existence. Colour wasn’t kind to Gallifrey though. The Three Doctors showed them as little more than inter-temporal police in dodgy robes, and, by creating Omega as one of their illustrious forebears, it actually succeeded in lessening the grandeur of the Time Lords. Then came The Deadly Assassin. 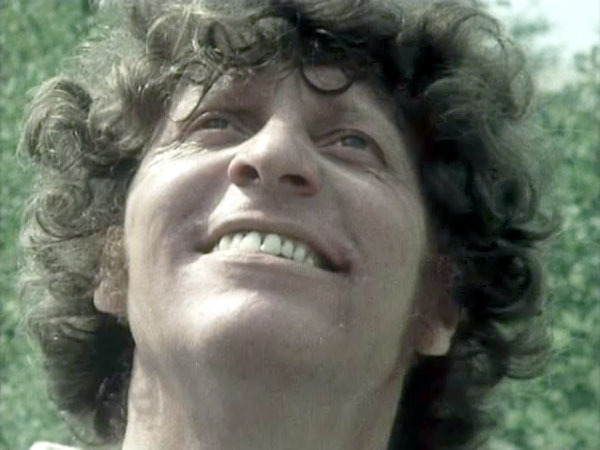 Robert Holmes, bless him, was a free interpreter of material from elsewhere, and The Deadly Assassin, as has been said ad nauseum, was his version of The Manchurian Candidate – political chicanery at the highest levels of Time Lord Society. Whatever you think of The Deadly Assassin as a Doctor Who story, it cemented its place well and truly into the show’s mythos, in almost too many ways to count. The Matrix, the Eye of Harmony, the this, that and the other of Rassilon, the way in which a Time Lord gets invested with the Presidency, big Time Lord headpieces, the chapters of Time Lord society (including the one into which the Doctor fits), and, oh yes, we knew there was something else – the number of regenerations a Time Lord can have, just lightly tossed into conversation, like a man-trap waiting for the future to find a way around (at the time of course, during only the Fourth Doctor’s era, it was practically inconceivable that the show could work its way through thirteen Doctors and ever actually come to a natural end – surely it would burn itself out at some point before that?). Looked at one way, The Deadly Assassin is a complete anomaly, unlike everything else around it – just the week before, a golden era of Who had ended with the ghastly, almost peremptory dismissal of Sarah-Jane because the Doctor had received a message from the Time Lords. Just the week after, a new golden era would be born with the arrival of Leela. But for four weeks between those companions, the Doctor was alone, himself, unfettered by companions and walking around the corridors of power on his own home planet. This was Doctor Who like there had never been before, and to give Tom Baker his absolute due, he pulls off the presence the Doctor needs in such circumstances with an aplomb that actually lends some credence to his idea at the time that he didn’t in fact need a companion. Looked at entirely another way, The Deadly Assassin is the progenitor of practically every Gallifrey story that would follow it. It was the end of the idea of the Time Lords as aloof and incorruptible. After The Deadly Assassin they were brought almost literally down to Earth, shown to be just as duplicitous as we could be, a political, conniving nest of vipers, and, let’s not forget, oh so dull. To some degree, The Deadly Assassin gave logic to the Doctor’s running away, by painting the Time Lords not as omnipotent gods of time and space, but a lot of stuffy academics and a political class always jostling for power and influence. And The Deadly Assassin lays the fundamental groundwork for future generations of Gallifrey stories. Every time we go back to Gallifrey from here on out, there will be a traitor in the midst of the High Council (The Doctor himself and Castellan Kelner in The Invasion Of Time, Hedin in Arc of Infinity, Borusa in The Five Doctors, seemingly the entire High Council in The Trial of A Time Lord, conniving with the Valeyard, Rassilon in both The End of Time and Heaven Sent). There will be people falsely accused, there will be stand-offs and intrigues, and often the death of innocents on the road to the villain’s goals. 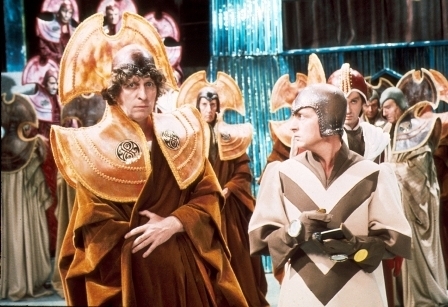 From mystery to judiciary to innocents doing all they could in The Three Doctors, The Deadly Assassin marks the moment when the Time Lords became capable of routine chicanery and darkness, rather than those being attributes of merely the occasional aberration like the Master. Let’s not, by the way, dismiss the Master – The Deadly Assassin was a brave story in that with the tragic death of Roger Delgado, the original Master disappeared from the Doctor’s life in a distressingly brief way after a final glorious performance in Frontier In Space. Rather than bring him back in the way that everybody understood the Master to be – urbane, witty, elegant – Holmes chose to go to the polar opposite end of the spectrum and deliver ‘the Master in desperation,’ a cowled, burned, horrifying, skeletal figure, determined to do anything to survive. 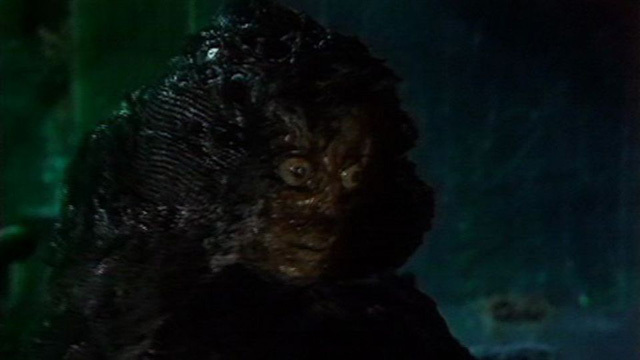 In Peter Pratt’s performance and the visual of the character in The Deadly Assassin, Holmes showed us ‘who the Master really was, all the time,’ and it was shocking and right, distancing the character from the Delgado version so as not to tarnish the original by imitation (only for all that good work to be undone at the end of The Keeper of Traken, when Anthony Ainley was brought in to play, at least visually, something of a Delgado-a-like Master throughout the rest of the Eighties). Pratt’s Master was a raw and wounded animal, a reminder that quite literally beneath the surface of the urbane academic sophistication of the Time Lords lay physical creatures that, if pushed, could go to quite extraordinary lengths of brutality. Brutality that saw The Deadly Assassin fall foul of the self-appointed censors in the National Viewers’ and Listeners’ Association under the steely gaze of Mrs Mary Whitehouse. To be absolutely fair, there were things in The Deadly Assassin which had never really been a part of Doctor Who before, particularly the mad surrealistic nightmare of the Matrix sequences, and the realistic violence of Chancellor Goth (played by Bernard Horsfall) seeming to drown the Doctor by force. While Philip Hinchcliffe would continue to flirt with the censure of the NVALA throughout his time as Producer on the show, it was The Deadly Assassin that drew most complaints for violence, after which Doctor Who wouldn’t go down the same road again until the time of Colin Baker – with similar, but less exceptionally worthwhile results. 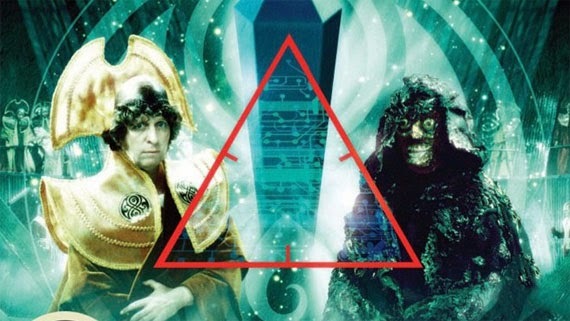 As we said earlier, whatever you think of The Deadly Assassin, and there are arguably plenty of reasons to dislike it (the cheapening of the mythos of the Time Lords, godawfully ‘futuristic’ – which is to say cheap and plastic – baubles of statecraft, a tautological title, the violence, the over-extended Matrix sequence of sheer weirdness, the plot which with the best will in the world baaaarely hangs together etc), there’s no getting away from either its uniqueness as a Tom Baker tour de force, its impact in terms of changing forever our view of the Time Lords and what they were capable of, or the casual delivery of so much Time Lord backstory that it would change and shape practically everything that came after it. For all those reasons, plus Peter Pratt’s bravura Master with the ping-pong ball eyes and Horsfall’s rather more grounded, misguided accomplice, it’s worth a re-spin once in a while, just to revel in the sheer force of creativity that went into mid-Seventies Who.